East Turkistan is located in the middle of Eurasia continent that is very distant from the ocean. It has Altay mountains on north, Tian Shan mountains (Tengri tagh) in the centre and Kunlun Mountains in southwest and the land is devided into 2 by the mountains. The area southward of Tian Shan is Tarim Basin that holds the desert Taklamakan in the centre. Since the ancient time, the oasis pockmarked in the penumbra of Taklamakan desert has had cities prospered and it played an important role in Silk Road. Dzungaria, located between Altay Mountains and Tian Shan Mountains has more rainfalls comparatively and therefore leafy prairies are formed there. By being distant from the ocean and surrounded by mountains, East Turkitan has a typical inland climate. Average rainfalls a year is as little as 5-80 mm on south and 100-250 mm on north. The amount of the rainfalls differs from the altitude of the area and it has an influence on the vegetation distribution. The strong solar radiation there makes the quantity of evaporation exceed the rainfall and counter measures against brine damage has become and urgent issue now. Average temperature in summer reaches 20-30 degrees while it reaches down to minus 1-20 degrees in winter. It is not only the seasonal temperature that varies but also the temperature within a day that can vary up to 20 degrees. Agricultural lands in East Turkistan are mainly located in the oasis regions in penumbra of Taklamakan desert on south, Urumqi, Ili and Altay on north. Wheat, sunflower (as oil crop), corn, cotton, kaoliang, sugar beet, sesame, tomato and rice are cultivated there. As East Turkistan is called 'Land of Fruit', it surely produces various ample of good quality fruits. Melon (the famous Hami Melon), watermelon, grape, pear, common fig, apple, peach and pomegranate are cultivated there. Famous fruits among them are grapes from Turfan, Melons from Atush and apples from Ghulja. By the initiative of the government, cultivation of high profit ratio products such as raw cotton, oil crop and sugar beet are carried forward rapidly. Most of the products are dominated by Hans, especially by the Xinjiang Production and Construction Corps that monopolise quarter to half of the entire products. The extreme desiccation and quantity of insolation make water control essential. Agricultural activities are operated mainly in the oasis regions that often appear on alluvial fan located in the transition point between the alp and plain. Upper part of alluvial fan (apex of fan) has water but the coarse fragment there makes it unsuitable for agriculture. Though the lower part has earth with fine granularity, salt accumulation often caused by the evaporation due to the shallowness of groundwater level and becomes a problem for agriculture. Therefore the land used for agricultural purpose tend to be located in the central part of alluvial fan. The granularity of the earth is adequately fine and salt accumulation is much less as the low groundwater level. To prevent the salt accumulation, making the ground water level low is effective. As precautions of salt accumulation, drainage by open and blind ditch, use of well and plantation of trees with long roots are set. River water is often used for agriculture. The water is impounded in a small dam and then shared into flumes used as canal irrigation for the agricultural land. The use of underwater source has been encouraged. The famous underground flume called Kareez (Qanat) is made to let the water flow from the sub-mountains rich with water directly to the settlements. It is constructed by making a pit hole in a few dozens of metres extended by cave holes. The longest flume reaches a few dozens of kilo metres. There are nearly 1,000 Kareez in Turfan Basin. However the huge inflow of Han, Land dominance and collective farming of Xinjian Production and Construction Corps, diversion of water use (agricultural to industrial) and priority of economic efficiency since the Economic reform in People's Republic of China caused uncontrolled water usage that ended up reducing the underground water drastically. The surface of the soil has salt accumulation and the land is running dry. There are villages that had to leave the land behind for lack of drinking water and devastation of the soil. The abandoned lands have been desertified swiftly. Preservation of site location, soil fertility and water source built up by residents' effort is destroyed in a few dozens of years. Pasturage in East Turkistan has been conduced in nomadic herding traditionally. Those tribes engaged in pasturage are Kazakh, Mongol, Kyrgyz and Tajik. Kazakh and Mongl tribes inhabit northan part of East Turkistan, Kyrgyz and Tajik tribes from south of Tian Shan to Pamir Mountains. They are descendants of nomadic who lived in those areas historically. Nomadic herding balances the feeding volume and vegetation volume by moving the lands around. This method of herding has been operated widely in the Steppes of northern Eurasia continent. It is said Scythia is the one who started nomadic herding and it has 4,000 years of history. As the lifestyle has merely changed, it is considered the herding style is most suitable for the Steppes of Eurasia continent. 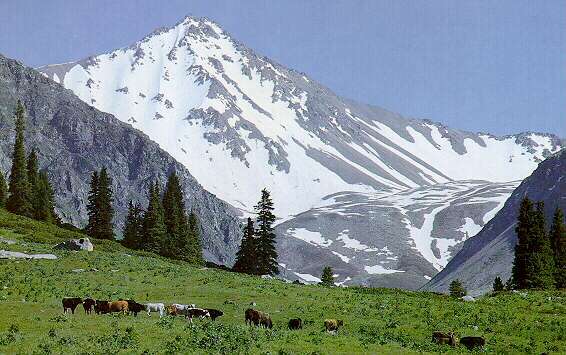 Style of nomadic herding in East Turkistan is to shift around the Steppes over the vegetation of different altitudes. There are 3 different ways to conduct nomadic herding in East Turkistan that are to have 4 areas to herd in each season, to have 3 areas to herd, one in summer, one in winter and the other in spring and autumn and to have 2 areas to herd in warm period and in cool period. Each area has different vegetation and it is not only effective to preserve soil fertility but also to keep the livestock healthy providing seasonal feeding. This also provide nomadic people comfortable living environment. They make settlements in high altitude Steppes in summer and sunny desert or shadow of the mountain that avoid the winds in winter. The most bred livestock is sheep while they also breed cows, goats and camels. Though nomadic lifestyle made it difficult for children to attend schools, the problem has been solved by the government policy of fixation of Nomads. However the forced fixation of Nomads is being the cause of desertification. The volume of vegetation in the Steppes, the semi-drying prairies, is greatly affected by the amount of rainfalls. Since ancient times, Nomads' right selection of herding lands and the number of livestock had been a cushioning to the fluctuation problem. However the acceleration of Nomads and herding land fixation has made the cushioning no longer functioning. Nomads controlled the number of livestock with whole society but after the People's commune's integration of farming and economic reform in People's Republic of China adjustments of livestock number is being dealt with contracted individual accountability system. The system connected the number of livestock directly to the income and this caused overgraze that deprived soil fertility and desertification. Cultivation of prairie is also being a problem. Though Steppes are not suitable for agricultural use as it has a little rainfall, a great number of the prairies have been cultivated for agricultural purpose by Hans and Xinjiang Production and Construction Corps. The cultivation with the salt accumulation caused by unplanned irrigation use created a huge barren land.